Can Heart Disease Be Hereditary? Genetics plays a strong role in the increase of your risk for many cardiac disorders. Some inherited cardiac disorders include congenital heart disease, familial dilated cardiomyopathy, and arrhythmias. 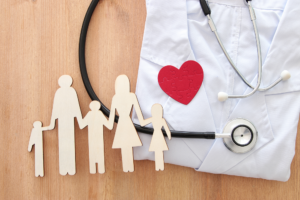 Having a family history of coronary heart disease, heart attacks, strokes, and heart failure are inherited risk factors that should be carefully monitored. Genes control the different functions in the body, including the cardiovascular system. Genes determine how the cells in your heart communicate with each other, and they can determine the strength and pliability of your blood vessels. A single mutated gene that is inherited from one or both parents is enough to determine your likelihood of developing a cardiac disorder. For example, a genetic mutation can change the way a protein processes cholesterol, which can possibly lead to blocked arteries. When your doctor is aware of your family history of cardiac problems, they can determine your likelihood of developing the same problems. For instance, a Harvard University study showed that people are more likely to have a heart attack if they have a parent or sibling who had a heart attack before they turned 50. Many of the inherited conditions that cause arrhythmias and sudden cardiac arrest that leads to death are well understood in the medical community. If you have relatives with any of these disorders, then schedule regular medical screenings and follow preventative treatment options. If you need to speak with one of our Mesa cardiologists about risk factors for heart disease or arrythmias, call our central schedule number at (480) 889-1573 to schedule your appointment. We can walk you through the various diagnostic testing options and treatment services available.